Where Is the Friend's Home? announces the intimacy of its focus from its opening shot, held on a door in close-up as the credits roll. The sound of children chattering and the unlatched door being blown ajar and closed again by the wind comprises all the action of the shot, until a shadow appears upon the door and footsteps near. The approaching person is the schoolteacher, reentering the classroom to scold his unruly wards. By focusing so intently on, effectively, nothing, Abbas Kiarostami makes the teacher's emergence that much more frightening, subtly aligning the audience's feelings toward the man with those of the children he harangues. One poor boy in particular, Mohammed Reza Nematzadeh, receives such a tongue-lashing for doing his homework on loose-leaf rather than in his assigned notebook that his thunderstruck terror filters through the camera and nearly turns the calmly filmed scene into a horror film. Kiarostami stays in a childlike perspective for the remainder of the movie. Adults never appear in full close-up, the way a kid processes a grown-up, and the even larger world around them can be as scary as it is wondrous and inviting. The world takes on these contradictory properties to an even greater extent for Ahmad, a classmate of Nematzadeh's who discovers he accidentally took his friend's notebook home with him. Aware that his hapless buddy faces expulsion if he enters class the next day without that book, Ahmad decides to return it. But with Nematzadeh in the town of Poshteh and Ahmad stuck in Koker, he needs some help getting there, help almost always denied him. The chief conflict in the warm, gentle flow of Where Is the Friend's Home? concerns the friction between Ahmad's earnestness and sense of personal duty and his elders' indifference. Relatives and strangers all talk about the values children need to be taught, but they get so lost in their narcissistic interpretation of what true responsibility and duty are that they utterly fail to notice how much Ahmad exhibits the values nominally taught to kids. The boy's grandfather opines that kids should be beaten regularly to instill discipline, even if they have done nothing wrong. The mother offers an even blunter response to her son's act of kindness, assuming he merely wants to get out of doing his own homework and finally shouting, "Obey!" 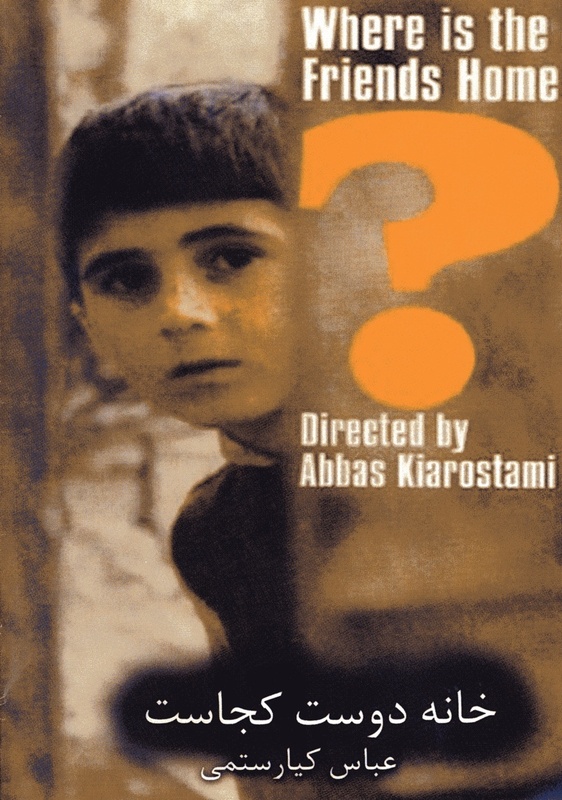 This outburst, yelled early into the film, crystallizes Kiarostami's commentary on the disconnect between morality and what is taught as such in school (which is, after all, a socializing institution as much as an educational one). Yet even as Kiarostami portrays the world as a harsh place, he infuses Ahmad's journey with a lyrical quality that constantly finds the warmth and humanity in people. Whenever Ahmad finds himself stymied by an indifferent adult, he runs into a child who proves far more understanding and helpful, creating a network of social interdependence that offsets the self-centered narcissism of the grown-ups. And not even all the elders are bad; as night falls on the increasingly desperate child, Ahmad finally receives assistance from an old man. Ironically, the gentleman's age makes him as much a hindrance as help, yet his willingness to engage with the kid makes their wandering through labyrinthine streets at night even more dreamlike and fantastical. Rather than appear as a token of enduring empathy, the old man acts as a playful guide, drawing out the already laborious walk around Iran's countryside even as he brings it to an amusing anticlimax. No one could deny that Where Is the Friend's Home? is a message movie. Its clearly drawn lines between callous, conditioned adults and their innocent, moral progeny show the director at his most didactic. Yet even this fable has its nuance and grace, from the grandfather's friend who gently asks Socratic questions that undermine his old pal's irascible pro-beating stance to the way the camera sometimes drifts off to follow the adults exclusively, momentarily forgetting the aesthetic and narrative arc simply to dwell with these other people. Most unorthodox of all is the ambiguity that hangs over this otherwise simple tale of generational conflict, the question of whether the elders who react with such apathy, even hostility, to Ahmad's quest were once as pure as he, and whether Ahmad and his friends will grow into jaded, "socially acceptable" adults too. Nothing underscores the complexity Kiarostami brings to the project like its ending, which amusing suggests that the final action Ahmad takes is at once a transgression and the most moral, even the most reasonable choice he could have made.